Trying to find a way to make these rocks work is a test in my patience as a human being. I've spent days now trying to use the sculpt without the original mesh, and it's been a huge trial and error process. This is my first time trying to use a sculpt in zbrush that isn't just a bake, the hardest part is finding something that's unwrapped. 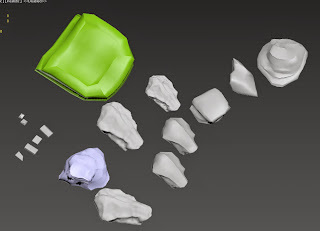 I've figured out decimating my sculpt, zremeshing, and unwrapping in zbrush to make an acceptable- but terribly optimized low poly rock to use as the base mesh. The problem now is unwrap space, I'm trying to import the obj in 3ds max to package it with everything else then use that fbx to bake the high poly onto, but for whatever reason that I cannot even begin to comprehend, xnormals won't align the high poly sculpt with the new unwrap. This rock is a time vampire and spending anymore time on it that I already have is going to cripple me emotionally. The only way I've managed to get this to work is using a low poly, decimated version with its own automated unwrap sheet all to itself. It's inefficient in both triangles and texture space, but I'm thinking I can just try and build extra assets into the texture sheet afterwards. EDIT: OK! Some progress- I've found t hat once I bake it all out with 1 asset per texture sheet, I can then take that and then repackage it in 3ds max, under the strict condition that I cant reunwrap or change the unwrap sheet. This is still profoundly irritating but at least I can get at least to rocks on a single texture sheet. It's not much, but right now it feels like a good compromise. These rocks still need texturing, but I feel like the hard part is done. Did some mushrooms to decompress- making absolutely sure I liked the 3ds max models before I normal mapped them, in fear of having to repeat the same grueling process again. In contrast though, the mushrooms were actually therapeutic.